The Mitsubishi T-2 is a jet trainer aircraft used by the Japan Air Self-Defense Force. In 2003, the first T-2 was retired. By March 2006, all T-2s had been retired. The Mitsubishi F-2 succeeded the T-2 training mission. It was widely believed that prior to operating and acquiring modern Mach 2 fighters, such as the Lockheed F-104J Starfighter and McDonnell F-4EJ Phantom would require a supersonic trainer aircraft, which was to be the T-X. Looking ahead, JASDF saw the T-X as a possible basis for a future single-seat fighter, which was named SF-W.
Supersonic jet trainers were popular, and many powerful countries owned and operated supersonic trainers for their own use. The United States owned the Northrop T-38 Talon, and France acquired the two-seater SEPECAT Jaguar as a trainer and single-seat fighter. Both the US and France realized the plight of the JASDF, and respectively offered their designs as a solution to Japan’s need of a supersonic trainer. 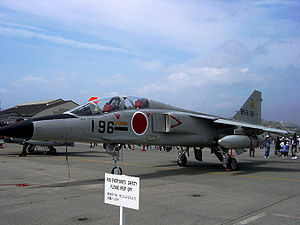 Japan considered both aircraft carefully, but their interest in the SEPECAT Jaguar surpassed that of the T-38 Talon, and the JASDF immediately tried to negotiate with France with a license to manufacture in Japan itself. Overwhelming nationalism and an issue with the Imperial family hindered the acceptance of either the Jaguar or the Talon, and in the end, JASDF decided to manufacture their own design, whose result would incredibly resemble the Jaguar. In 1967, Japanese aviation firms Fuji, Kawasaki, and Mitsubishi, each submitted proposals, and in September 1967, under lead designer Dr. Kenji Ikeda, Mitsubishi’s prototype was selected. The official contract was issued for the development of the XT-2, one year later. Several other subcontracts with aerospace firms and other minor aviation manufacturers were also established. By the spring of 1969 the design had been finalized, and the XT-2 prototype performed its maiden flight on 20 July 1971, with pilots Kenshiro Endo and Mitsui Sato in the cockpit. The XT-2 was followed by three more prototypes, and became the first aircraft of Japanese design to break the sound barrier in level flight. Two of the four prototypes were armed, and the other two were not. The XT-2 entered JASDF service in 1975. 90 production T-2s were built, including 28 unarmed "T-2(Z)s", or "Zenkigata (early type)" and 62 armed "T-2(K)s", or "Kokigata (late type)"; some sources translate these variants as "T-2A" and "T-2B" respectively. An additional two T-2(Z)s were built but modified for the S-FX / F-1 strike fighter program. The last T-2 rolled off the assembly line in 1988. It wasn't too surprising that Mitsubishi engineers saw the Jaguar as something of a model for what they wanted to do, considering JASDF’s desperate need for a supersonic trainer aircraft. The T-2's configuration was clearly reminiscent of that of the two-seat Jaguar, with the two aircraft having the same overall configuration and some resemblance in details. In particular, the T-2 was also powered by two Rolls-Royce Turbomeca Adour turbofans, the same engines used by the Jaguar, license-built by Ishikawajima-Harima Heavy Industries under the designation "TF40-IHI-801A". The Jaguar's role in the T-2's design is as "inspirational". Despite its initial resemblance, the two aircraft could be distinguished at a glance, the T-2 having a more dartlike appearance, being noticeably longer and having a distinctly shorter wingspan than the Jaguar. The T-2 also had many detail differences. For example, since the JASDF had no rough-field requirement, the T-2 had conventional single-wheeled landing gear and not the distinctive "farm tractor grade" landing gear of the Jaguar. The T-2 was made mostly of aircraft aluminum alloys, though it featured selective use of titanium. The high-mounted wings had a leading-edge sweep of 42.5 degrees and a 9 degree anhedral. The wings feature a noticeable "leading edge root extensions (LERX)" and full span leading-edge flaps, with a "dogtooth" discontinuity on the outer edge of the span, though the dogtooth did not split the flap. There was a single 3/4ths-span flap in the back, unlike the split full-span double slotted flaps of the Jaguar, but the T-2 did have twin spoilers on each wing just forward of the flap for roll control instead of ailerons, another element clearly derived from the Jaguar. There was a small fence mounted inboard on the top of the wing. There were no fuel tanks in the wings. The tail assembly was conventional, featuring slab all-moving tailplanes with an anhedral of 15 degrees. The steep anhedral kept the tailplanes out of the engine exhaust while allowing them to remain effective through the wing wash. Like the Jaguar, there was a fixed ventral fin under each exhaust, and a hydraulically-operated airbrake just forward of each ventral fin. Each Adour engine provided 22.75A kN (2,320 kgp / 5,115) max dry thrust and 32.49 kgp (3,315 kgp / 7,305 lbf) afterburning thrust. The TF40-801As did not have the "part throttle reheat" feature added to Adour 102s as an engine-out safety feature, and the T-2 was never refitted with more powerful Adour engine variants, along the lines of the Adour 104 eventually refitted to British Jaguars, leaving the T-2 somewhat underpowered. The engine intakes had fixed rectangular geometry and fuselage splitter plates, plus a set of spring-loaded auxiliary inlets behind the intake lip for increased airflow in ground running. There were large service doors beneath the fuselage that provided excellent access to the engines for maintenance. The T-2's landing gear all featured single wheels, with the nose gear retracting backward and the main gear retracting forward into the fuselage, rotating 90 degrees to lie flat, another scheme that echoed the Jaguar. The nose gear was offset slightly to the right, with a small fixed vertical airfoil mounted in front of it to compensate for the extended nose gear's tendency to cause yaw. The landing gear featured an antiskid control system. Also like the Jaguar, the T-2 had a runway arresting hook, in this case on the underside of the tail behind the engine exhausts, and a drag chute in the tailcone. The crew sat in tandem, with the flight instructor sitting behind the student on a raised seat to give a good forward view. There was a windblast screen between the two cockpits. The aircrew sat under separate clamshell canopies on Weber ES-7J zero-zero (zero altitude, zero speed) ejection seats, built by Daiseru. The seats featured specially modified canopy penetrators to ensure safe ejection even if the canopy wasn't blown off. The seats also dispensed a cloud of radar-reflecting "chaff" on ejection to allow ground controllers to spot where the ejection occurred and direct search and rescue teams to the proper area. Standard equipment for the armed T-2(K) included a Mitsubishi Electric J/AWG-11 search and ranging radar in the nose; a French Thomson-CSF head-up display (HUD), license-built by Mitsubishi Electric; a Lear-Siegler 501OBL automatic heading and reference system (AHRS); as well as a UHF radio, an identification friend or foe (IFF) system, and a TACAN radio beacon navigation receiver system, all built in Japan. The J/AWG-11 was basically a member of the family of radars fitted to the US F-4 Phantom, in specific being very similar to the AN/AWG-11 fitted to the British Royal Navy Phantom FG.1. The unarmed T-2(Z) lacked the radar, though apparently its avionics kit was otherwise the same as that of the T-2(K). - T-2(K) : T-2, T-2B. Two-seat armed weapons training aircraft. - T-2 CCV : Experimental Control Configuration Vehicle testbed, built from the third T-2 produced. Includes three canards.